Several Muslims gathered at the Macau Mosque and Cemetery yesterday to celebrate Eid al-Adha, roughly translated as the festival of the sacrifice. According to Islamic tradition, Eid al-Adha is the second major festival in Islam, which is to commemorate Ibrahim’s (Abraham in Judaism and Christianity) willingness to sacrifice his son Ismail (Isaac) as an act of submission to the command of Allah. Apart from praying at the Macau Mosque, Macau Muslims also sacrifice a cow at the Macau Slaughter House as a non-obligatory ritual. Adnan Nasim, a member of the local Muslim community, told the Times that they would take an animal to the Macau Slaughter House in a group of seven and sacrifice it there. “The only thing is, when we slaughter it, we call it halal. We have a certain way that we cut the neck (of the animal) in a way that the blood will come out from the body. (…) And we pray to God for his blessings for whatever he has given us,” he explained. After the ritual, the meat will be brought to the Mosque and distributed among the needy, the poor, relatives and friends. Mr Nasim said that by giving part of the meat to the needy in the local community, it enables Muslims to interact with locals instead of living in solitude and staying away from other groups. However, he said that it is a rather expensive practice for Muslims in Macau and it is not easy to find seven people willing to contribute to the ritual. “This year, for seven people, the contribution per person is between MOP6,000 and MOP7,000, which is around MOP42,000 for a cow,” he said. An alternative and cheaper way to perform this ritual is to do it in other places. In fact, some Muslims in Macau choose to cross the border and travel to Huaisheng Mosque (also known as Lighthouse Mosque) in Guangzhou for the festival. The Huaisheng Mosque was built more than 1,300 years ago. Some believe that the prophet Muhammad’s uncle was buried there. 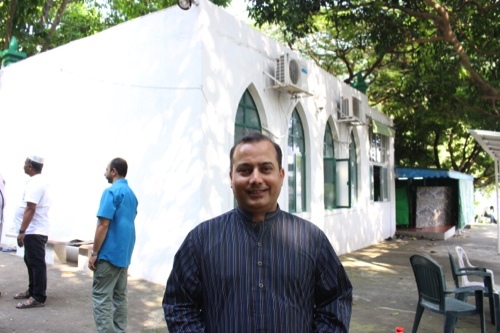 Mr Nasim said that Huaisheng Mosque attracts Macau Muslims during the festival because of the fact that people can choose other animals such as lamb and goats to sacrifice instead of being limited to cows. The prices of animals are considerably cheaper in Guangzhou as well. “And they find it easier to distribute the meat because there are a lot of poor people [in Guangzho]. So they feel like it is more appropriate to cross the border to go there,” he said. Another major Muslim festival is Eid al-Fitr, the Festival of breaking of the fast, which takes place after the fasting month of Ramadan. The next Eid al-Fitr will be in mid-July next year. The Macau Mosque’s previous imam (religious leader of a Muslim community) has passed away. Adnan Nasim said that the new imam should arrive in Macau soon. Although he does not know the nationality of the new leader, Mr Nasim understands that the new imam can speak several different languages including English, Russian, Arabic and Bahasa Indonesia. He thinks that it is good for the cleric to know Indonesian so that he can better communicate with Indonesians in the local Muslim community. Indonesia is a predominantly Muslim country. According to the Macau government’s Human Resources Office, there were 3,955 Indonesians working in Macau in August, making them the fourth largest non-resident worker community in the city.